The 20 Mark Prussia Wilhelm I. gold coins date from the time of the German Empire. They were published under Wilhelm I., who reigned from 1871 to 1888 as an emperor, and were legal tender in daily circulation. The Kingdom of Prussia was the largest and most influential single state of the German Empire, with two-thirds of the area and about three-fifths of the population. After victory in the Franco-German War Wilhelm I., who was King of Prussia since 1861, was proclaimed the first German Emperor on 18 January 1871 in the Palace of Versailles. Under his rule, the 25 German states were united into a German empire, while each of the Regent States had the right to mint its own Reichsgoldmark. The free cities of Bremen, Hamburg and Luebeck minted the city coat of arms on the front of their coins. As part of the creation of the Empire a monetary reform was carried out and the Taler was replaced by the Mark as legal tender. The most common coins found are the ones of Wilhelm I. and Wilhelm II. (who reigned from 1888 to 1913),which even today are very well suited for gold investment. There are also coins of other rulers, but these can only be found in a much lower circulation and thus come with higher premiums. For numismatists particularly the year 1888, called the "Three Emperors year," is interesting. In this particular year coins with three different motives were issued, since Kaiser Wilhelm I. died in that year, his critically ill son Kaiser Friedrich III. succeeded him to the throne, but after 99 days reign, succumbed to cancer and was replaced by the last German emperor Wilhelm II. In November 1918, after the end of the 1st World War II., which he himself had triggered by his ambition for world power, his aggressive policy against the other major powers and his overall readiness for war, the Prussian King and German Emperor Wilhelm II. was forced to abdicate, leading thus to the end of the empire. These historic 20 Mark gold coins were produced in the fineness 900/1000. An alloy of 10 percent copper increases the resistance and scratch resistance of these gold coins, meaning they are still in very good condition today. The 20 Mark Wilhelm I. gold coins have a fine weight of 7.16 grams of gold, a total weight of 7.965g, a thickness of 1.40 mm and a diameter of 22.5 mm. The obverse of the coins shows the respective king and the reverse the coat of arms, the face value and the year of issue. There are three different types of coins: 5 RM 10 RM and 20RM, which are distinguished by size and weight. The front of the 20Mark Wilhelm I. gold coin shows a portrait of Kaiser Wilhelm I., bareheaded, facing right, and surrounded by the following inscriptions: "Wilhelm", "Deutscher Kaiser" and "König von Preussen"
The back of the coin shows the imperial eagle with shield, surrounded by the inscriptions: "Deutsches Reich", the year of issue and "20 Mark" (the nominal value). In 1874, the abbreviation "M" (Mark) on the coin was abolished and replaced by the word "Mark" in order to anchor the new currency more firmly in the minds of the population. In 1890 the small Imperial eagle with great Hohenzollern shield (symbol of the supremacy of Prussia),became a large imperial eagle with small shield. By doing so, Wilhelm II. wanted to emphasize the German unit. The design of the new coin eagle is by Otto Schultz of Berlin. 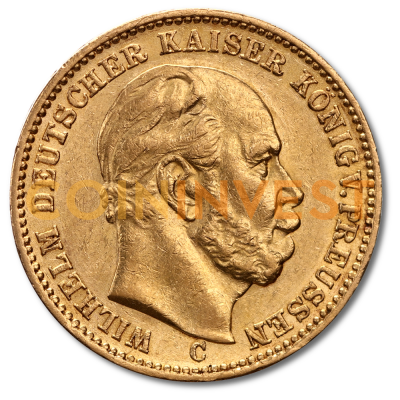 Even 120 years and multiple currency reforms later, the 20 Mark Prussia Wilhelm I. gold coin has kept its value and is a globally popular collector's coin, which also has a lot to do with the material from which it was minted.